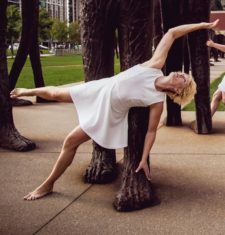 Amanda Exley Lower is a dancer, choreographer, teacher, and community builder, reaching audiences and students from Agnes Scott to the English Avenue neighborhood. Lower currently serves as a lecturer in the Agnes Scott Dance Program and as a teaching artist for Moving in the Spirit. She and her family recently relocated to Atlanta from Chicago. While in Chicago, Lower was the Executive and Artistic Director of Striding Lion Performance Group, an interdisciplinary arts company equally committed to performance and outreach and as an adjunct professor of dance at Northwestern University. Lower’s dance performance highlights include appearances with the Jose Limon Dance Company, Clay Taliaferro, Shapiro & Smith, and Tere O’Connor. Lower has also played lead acting roles such as Kaspar in Peter Handke’s Kaspar and as Claire in Jean Genet’s The Maids. Her choreography has been performed in Chicago (Links Hall, The Josephine Louis Theater of Northwestern University, the Neofuturarium, Hairpin Arts, Berger Park, the Swedish American Museum), Atlanta (The Modern Atlanta Dance Festival, the Conant Center for the Performing Arts, the Beam, 7Stages), New York City (The New York International Fringe Festival, Free Range Arts of NYC, Tisch Fifth Floor Theater), Cleveland (Cleveland Public Theater), Salt Lake City (Salt Palace), and in Durham, NC (Reynolds Theater, The Ark). She received a BA from Duke University and an MFA in dance performance and choreography from NYU’s Tisch School of the Arts, with additional studies at the University of Ghana in Accra. She is also a certified Pilates instructor.